I thought I’d dedicate a post just to my favorite pancakes of all time. 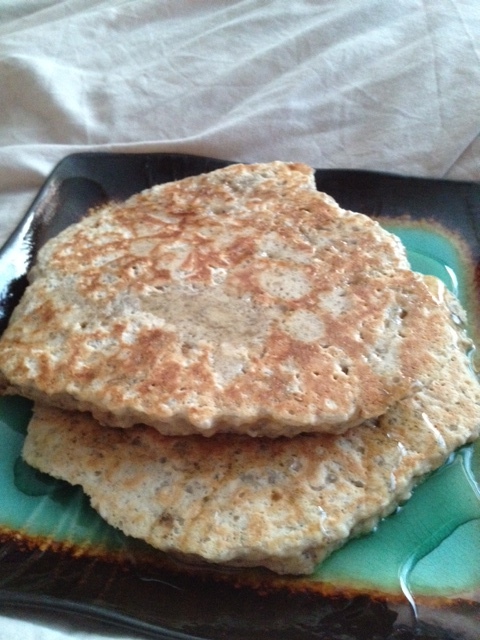 Ok, they’re my favorite ‘healthy’ pancakes that I eat on the regular. I didn’t start making these until after I purchased my Vitamix because I think the machine is what does the recipe justice. (How do I know? Because my previous cuisinart blender was a piece of crap and even my parent’s Ninja blender can’t hold a flame to blending the ingredients just right). Add all ingredients into blender* (i use the dry container for my Vitamix). Blend until smooth. Pour silver dollar sized amounts of batter onto hot, sprayed skillet. Flip when you see the edges starting to look ‘dry’. *Note: I will add egg whites first, oats then greek yogurt. If oats are placed in first, it makes it difficult to properly blend and you’ll make a couple attempts of scraping down the sized of the container with a spatula. And then when that happens, the batter will splatter around the container when you turn it back on. Once in a while I will add a 1/4 cup fruit into the blender for a pop of color and/or flavor. And unless we are somehow out of it (OH THE HORROR) I always top my pancakes with Canadian maple syrup. Noms. What are you favorite pancakes?